Manuscripts and photographs are an increasingly popular area of collection. Early photographs of unusual subjects can command impressive prices, particularly for early images of far-flung parts of the Empire or Grand Tour images from Europe. Equally, manuscripts can encompass anything from indentures to letters and autographs, all of which have enthusiastic collectors. The first practical process creating a permanent image was invented by Frenchman Louis Daguerre. The Daguerreotype, which was also known as 'the mirror with a memory', was announced on 7th January 1839. The Daguerreotype process was immediately popular. Suppliers of apparatus and materials were besieged by customers eager to try their hand at picture making. The art world was equally disturbed by the process. The painter Paul Delaroche exclaimed on seeing a Daguerreotype: "from today, painting is dead!" However, the process was far from perfect. An archival collection of photographs and other documents recording the first non-transatlantic flight on 14th June 1919 by Alcock & Brown (BK8/438) realised £12,500. The Daguerreotype was the first photographic process to be widely used but it was not from this that modern photography evolved. The prototype behind modern photography is generally credited to an English contemporary of Daguerre, Fox Talbot, who arrived at a negative and positive photographic process on paper. He published the first book to be illustrated with photographs in 1844, which was entitled The Pencil of Nature. As the century progressed, this new medium for 'capturing the moment' also captured the imagination of the public, along with many now recognised photographers such as Roger Fenton, Julia Margaret Cameron, Francis Bedford, James Valentine, PH Emerson, Francis Frith, Felice Beato, Frank Meadows Sutcliffe, John Thomson, etc, etc. The amateur gentleman photographer was to flourish, although frequently struggling with the latest technology. These photographers, often unknown, managed to record some of the most intriguing scenes of the nineteenth century - China, India, Japan, West Indies, Egypt, Africa, Australia, Americas. Great interest is created when albums containing their photographs are offered on the market, which was the case recently when we offered an album of the 1890s. This album contained nearly 100 pages of photographs, many of them native studies from in and around the Gold Coast. The photographer was indentified as one Arthur Homewood of the United Africa Company. The hammer finally fell on this lot at £8,600. Similarly, a collection of eighty late nineteenth century loose photographs of India were sold for £2,200. Most of these photographs were signed in the negative, "Sache". The photographs represented a broad range of life in 1870s-80s India with street scenes, tradesmen, architecture, marajahs, and the Himalayas. Intriguingly, there was even a photograph of the "Sache Portrait Rooms". John Edward Sache was a European photographer, who began work in Calcutta in 1865. During the 1870s, Sache ran studios in Lucknow and other places before leaving India in the early 1880s. Photographs recording military campaigns are also of great interest, such as the Crimean War, Indian Mutiny, Opium Wars, Afghanistan, Boer War, and in America the Civil War. Even albums of photographs of twentieth century events, especially World War I, are keenly sought after. 20th Century "Art" photographs, often recording a rich social history, are also keenly sought. Photographers such as Alvin Langdon Coburn, Henri Cartier Bresson and Man Ray are certainly in demand by the collector. Photography related to any historical event often commands good prices at auction. 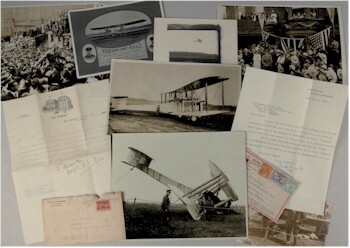 For instance, we offered an archival collection for auction in 2012 consisting of original photographs along with telegrams, signed letters, signed menu cards and technical data all relating to the first non-stop transatlantic flight by Alcock & Brown on the 14th June 1919. The collection had been put together by the Works Manager at the Vickers Aviation Company (who supplied and maintained the aircraft) providing it with immaculate provenance. This highly important historical collection fetched £12,500. a cache of personal papers of a nineteenth century diplomat posted to some remote corner of the British Empire. All 'one offs', all of importance, all worthy of further study, all to be preserved for posterity, all have recently been sold in one of our antiquarian book auctions.